20 UCW SEPTEMBER 20 - 26, 2017 WWW.UPANDCOMINGWEEKLY.COM The Hope Mills Kiwanis Club is full of members who volunteer their time to help with local schools and nonprofits in order to benefit children and families who are in need. I had the pleasure of being Kiwanis Club Treasurer Jan Spell's guest to the club's monthly meeting at Sammio's. Each member who attended welcomed me with a warm embrace — not the side hug from strangers. No. These generous people each greeted me with a loving hug that let me know they care about this community and giving back. They are passionate about their commitment to this community. The Hope Mills Kiwanis help with ensuring children have school supplies. They help the ALMS HOUSE of Hope Mills feed over 400 children each week. The list of generous and compassionate deeds is continuous. With 31 members thus far (and count- ing), the Hope Mills Kiwanis Club has grown three-fold, and it's looking for more mem- bers. Each member I met comes from a differ- ent career background. Teacher. Commissioner. Military. Retiree. And now myself — a marketing consultant/writer. The Hope Mills Kiwanis Club has a full agenda that keeps its members busy and also entertains, feeds and — most importantly — gives back to the community. The Kiwanis will be in full sup- port of the "Peace, Love and Walk" presented by Members Credit Union, which benefits the ALMS HOUSE in Hope Mills. Donations made to the walk-a-thon will go towards helping those in Hope Mills who have incomes below the poverty level. For more information, visit www.memcu.com/ peace-love-walk or call Delores or John at (910) 425-0902. The walk will be on Oct 7. Also, everyone knows that North Carolina loves its barbeque. On Oct. 13, the Kiwanis Club will host a BBQ fundraising event. Proceeds from this event will go towards providing for the Kiwanis-connected school clubs, those less fortunate and other service projects. The schools have different clubs depending on the ages of the child. For elementary stu- dents, the K-Kids Club participates in service projects around the community that benefit not only those in need, but the children them- selves. Children in middle school and junior high will have a chance to engage in service projects and will also learn about and im- prove self-esteem and grow in leadership. The Key Club is for high school students who de- sire to give back and want to learn more about being a leader. Circle K is the university-level club and also claims to be the largest leader- ship organization in the world. One of the best things about Kiwanis is that it does not leave anyone out. Adults with disabilities also have an opportunity to give back through service projects in the Aktion Club. The Aktion Club is the only service club where these individuals can learn more about leadership skills. Contact the Kiwanis of Hope Mills at (910) 426-7256 for more information about becoming a member. ERICA WALLS, Contributing Writer. COMMENTS? 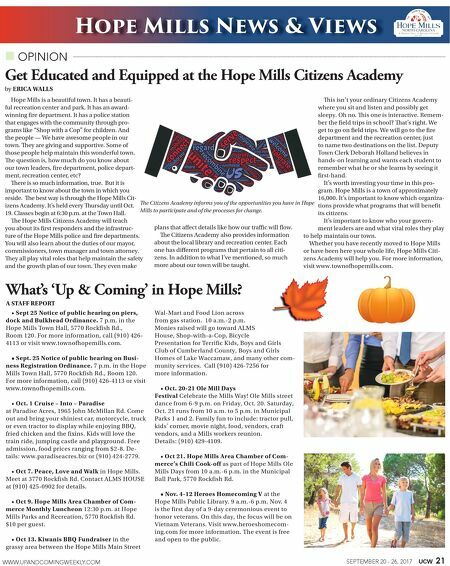 hopemills@upand- comingweekly.com. (910) 484-6200. The Hope Mills Kiwanis Club has a full agenda that keeps its members busy and also entertains, feeds and — most importantly — gives back to the community. 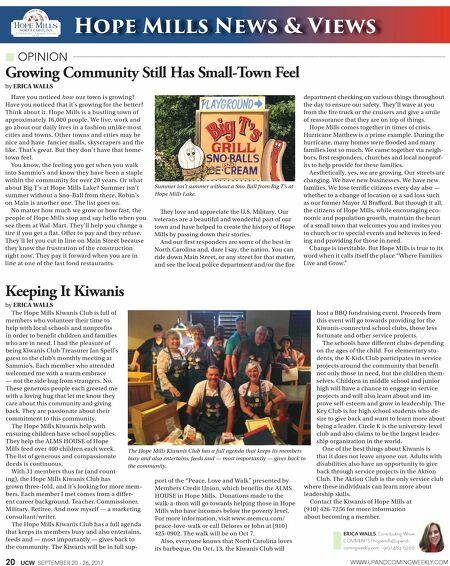 Keeping It Kiwanis by ERICA WALLS Hope Mills News & Views OPINION Growing Community Still Has Small-Town Feel by ERICA WALLS Have you noticed how our town is growing? Have you noticed that it's growing for the better? Think about it. Hope Mills is a bustling town of approximately 16,000 people. We live, work and go about our daily lives in a fashion unlike most cities and towns. Other towns and cities may be nice and have fancier malls, skyscrapers and the like. That's great. But they don't have that home- town feel. You know, the feeling you get when you walk into Sammio's and know they have been a staple within the community for over 20 years. Or what about Big T's at Hope Mills Lake? Summer isn't summer without a Sno-Ball from there. Robin's on Main is another one. The list goes on. No matter how much we grow or how fast, the people of Hope Mills stop and say hello when you see them at Wal-Mart. They'll help you change a tire if you get a flat. Offer to pay and they refuse. They'll let you cut in line on Main Street because they know the frustration of the construction right now. They pay it forward when you are in line at one of the fast food restaurants. ey love and appreciate the U.S. Military. Our veterans are a beautiful and wonderful part of our town and have helped to create the history of Hope Mills by passing down their stories. And our first responders are some of the best in North Carolina and, dare I say, the nation. You can ride down Main Street, or any street for that matter, and see the local police department and/or the fire department checking on various things throughout the day to ensure our safety. ey'll wave at you from the fire truck or the cruisers and give a smile of reassurance that they are on top of things. Hope Mills comes together in times of crisis. Hurricane Matthew is a prime example. During the hurricane, many homes were flooded and many families lost so much. We came together via neigh- bors, first responders, churches and local nonprof- its to help provide for these families. Aesthetically, yes, we are growing. Our streets are changing. We have new businesses. We have new families. We lose terrific citizens every day also — whether to a change of location or a sad loss such as our former Mayor Al Brafford. But through it all, the citizens of Hope Mills, while encouraging eco- nomic and population growth, maintain the heart of a small town that welcomes you and invites you to church or to special events and believes in feed- ing and providing for those in need. Change is inevitable. But Hope Mills is true to its word when it calls itself the place "Where Families Live and Grow." Summer isn't summer without a Sno-Ball from Big T's at Hope Mills Lake.